Making sweets can be fun all year round, but particularly at Christmas and other special occasions. These sugar free fridge sweets can be made as gifts or kept and eaten by you and your family as a treat. Once they have set hard, cut them into slices or squares and remove from the tin. They should store well if you keep them in the fridge or in an air tight container. They can also be individually wrapped in foil or paper. Place several in a box on top of paper and wrap with colourful paper and ribbon. Because no sugar is used in these recipes some of the sweets will not be as hard as other versions. In this recipe try using sugar free apricot jam as your sweetener. Those who want to make pink and white coconut ice can use a little red food colouring in half their mixture. Using a hand blender or food processor, whiz up your sugar free apricot jam in a large bowl with your cream. Stir in your desiccated coconut until your mixture becomes very dry. Separate in two bowls and add a drop of red food colouring to one, to create a salmon pink shade. Grease an 18cm fudge tin and press the red coconut ice right into it, making sure it is evenly distributed. Take your white coconut ice and do the same on top. Place in the fridge and chill overnight. Slice and serve. NB This version will be softer than coconut ices than use sugar or icing sugar. A deliciously rich sweet, you’ll probably only want to eat one or two of these at a time. Serve them with coffee at the end of a meal - or indulge in one or two with a glass of brandy. Melt your honey, butter and cocoa powder in a small saucepan over a low heat. Once completely smooth, stir in your whipped cream. Remove from the heat and allow to cool. Place in the fridge for half an hour or so, until firm enough to roll into balls (make sure it doesn’t completely set hard). 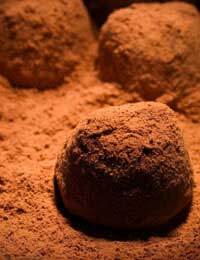 Then roll into balls and roll in a little sieved cocoa powder. Use whichever dried fruit and nuts you like in this recipe. Hazelnuts and raisins work well, but peanuts, cranberries and ingredients can be just as tasty. Melt your honey, butter and cocoa powder in a small saucepan over a low heat. Once completely smooth, stir in your fruit and nuts. Remove from the heat and allow to cool. Pour into an 18cm greased fudge tin. Place in the fridge and allow to set. Slice into squares.